The very first entries for the School Log Books date from 1863 when classes were held in a School Room behind The Rectory (now Uplowman House). 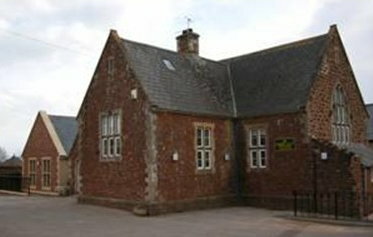 However it is reported in White’s Devonshire Directory of 1850 that “a school for poor children is supported by subscription” which implies that the school was in existence much earlier. From the records dated 7 October 1863 it quotes “found by examinations that all the first class girls are able to do long division quite perfectly”. Whether the boys attended from this is unclear. The new school building was officially opened on 16 July 1874, and a service was held at the church followed by a procession to the school. From the census records of 1881 it shows that a Clara Flood was resident at School Cottage and described as “schoolmistress” so was probably the earliest teacher. By 1891 Emma Searchfield (aged 31) was the head teacher living at School House and was joined by 1901 by her sister Bertha as the assistant teacher. They were still there in the 1911 census. As was normal in those days both were single. To show that times change (but some of the names are still familiar) it was recorded in January 1930 that “Frances Redwood received a prize for Excellence of Essay on Health. Lily Thomas received a certificate for Food Essay on How do Cleanliness and Fresh Air make the Home Healthy”. In 1874 there was a Centenary booklet published which recalls the history of the School plus many old photographs. Click this link to access the booklet in PDF format. be patient though as the file size is nearly 2mb but it is worthwhile. A copy of the file can be obtained from the web master.